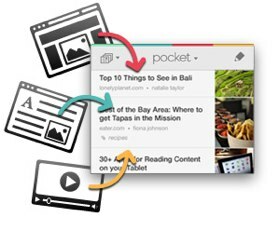 Founded in August 2007 by Nathan Weiner, Pocket has a mission that similar to Dropbox’s: it wants to give you access to that content on any of your devices, be it a phone, tablet, television, or computer, without having to think about where you saved what. When you discover an interesting article, video or web page, but don’t have time to view it you can save the URL to Pocket, and the list of content will be visible on any device. While Read It Later was previously a paid app, with today’s relaunch, Pocket’s Android, iOS and Kindle Fire apps have been set free. Not only does Pocket allow you to save content from the web, but the service also lets you mark content from over 300 apps–including Flipboard, Twitter, Pulse, and Zite. With the new version of Pocket, users will see a new, cleaner UI, as well as filters for video, image and text content. Pocket has also added new organizational tools for content, so users can favorite content, tag content with categories and keywords and more. Over the past five years, Pocket users have saved over 200 million items. Weiner adds that nearly five items every second are saved to Pocket from the web and apps. Around 33 percent of saved items come from 3rd party apps including Twitter, Zite, Flipboard and Pulse and 50 percent of items saved via Pocket are viewed on mobile screens (up from 34 percent in January). And 40 percent of items saved are not articles; popular content includes videos, images, things to buy, travel tips and recipes. Pocket says that web consumption peaks in the early morning and declines through the day, as consumers dig through their inboxes and find what they want to view later. iPad use peaks at night, as users view saved content in the pre-bedtime hours. Mobile consumption maps to commuting times, as users increasingly view content in transit. YouTube is the apps’ most popular source of content. 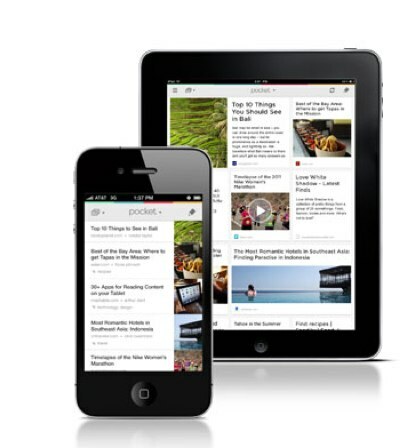 A year ago, Pocket had 2.5 million users; now it has 4.5 million. Pocket isn’t the only application that is trying to play in the “read it later” space. The app faces competition from Readability and Instapaper. More recently, there has been debate over some of the copyright issues that these services could face from publishers. Pocket has raised $2.5 million in funding from Foundation Capital, Baseline Ventures, Google Ventures, Founder Collective, and several angel investors.